365 days, 365 stories – 365 lies. 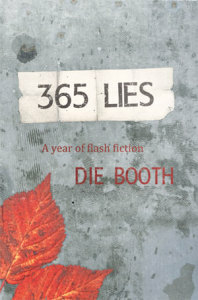 365 Lies: a single author collection by Die Booth. From the author of Spirit Houses comes a collection of flash fiction, written one story a day for the duration of 2013. An old photograph, a list, a sinister vending machine; found things and stolen things and magic things. Holidays, love affairs and breakups, in the past, the present, and futures both brutal and beautiful. A diary of highs and lows, seasons and events in fictional form, 365 Lies (with one extra in case of leap year) will take you on a real-life journey through genres, times and places that is guaranteed to ignite at least one little spark in every reader. With cover art by Earl Foolish, 365 Lies is out now in print and ebook. All profits from the sales of this book will be donated to the Motor Neurone Disease Association.